Hobby Circuit - VARIABLE ISOLATED AC VOLTAGE SPANS 0VAC TO 280VAC __ Circuit s designed by David A. Johnson, P.E. In electronics, it is often handy to have a fully isolated variable AC power supply. With such a device you can safely test various AC powered circuits and even probe around in the circuit with an oscilloscope. 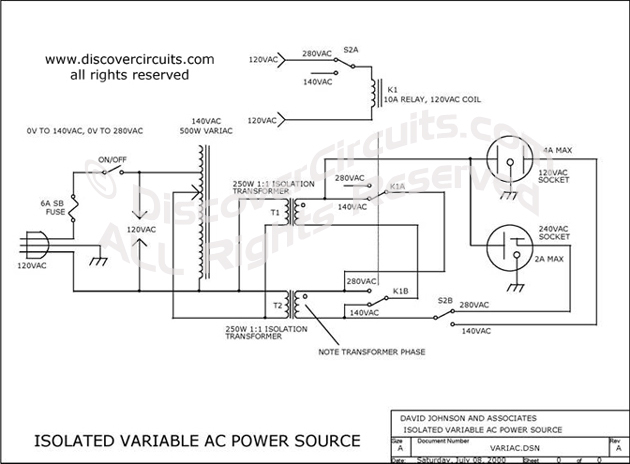 The hobby circuit below was designed to provide up to 500 watts of AC over a range of zero volts to over 250vac. For safety, it is designed with two separate outputs. One output ranges from zero to about 140vac. The second output ranges from zero to over 250vac. Different sockets are used, so a standard 120vac device can’t be accidentally plugged into the higher voltage socket. An AC volt meter and an AC current meter could be included if desired as shown in the photo below. A three position left off toggle switch is uses on conjunction with a power relay to route power to the appropriate socket and to switch power from the two 250 watt isolation transformers.